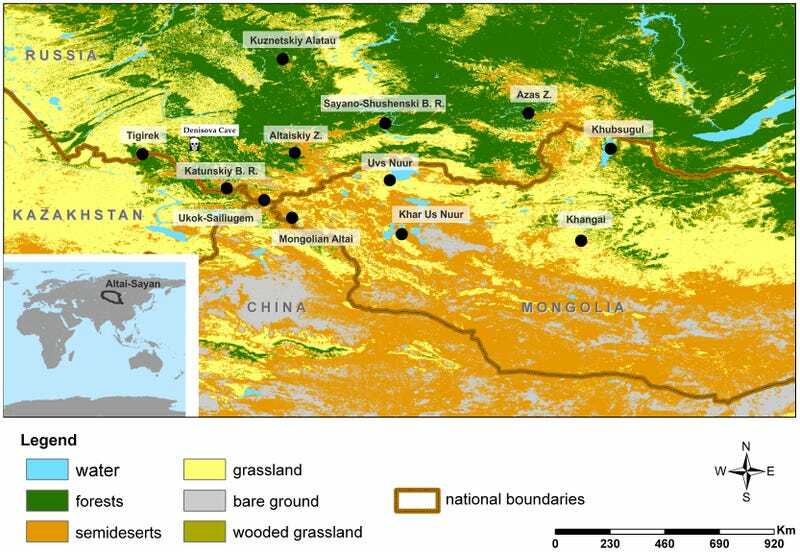 A new article in PLoS One details the ecology of the still partially-explored Altai-Sayan region, where the animals present have been quite consistent for tens of thousands of years with just the occasional loss of a few species like mammoths. I have adjusted the map above from the article to show the location of the Denisova Cave (or Ayu Tash, Bear Rock in Altay), within the Altai. This, of course, is the cave where Denisovans, Neanderthals and Sappys co-existed for some time. The hunting would have been stable and reliable even through Ice Age changes with mixed woodland, grassland and semi-desert. This area is perhaps the only place to still have this mix of fauna. The large animals were abundant but there were plenty of small game as well. The local flora includes wild cherries and apples, blueberries, currants and many other edible fruit, green veg, nuts, fungi and tubers. It is thought that the future Americans spent some time in this region before moving east and crossing Beringia. Happy Hunting Grounds?